Hey guys! 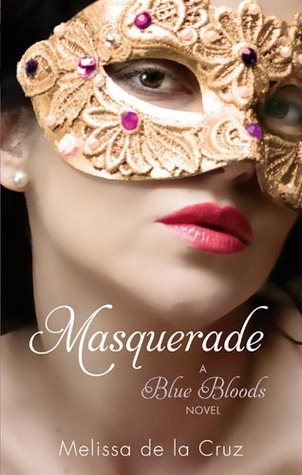 I finished reading Masquerade and Revelations awhile ago and am now on The Van Alen Legacy. And I'm almost done with that too! I'm addicted to the Blue Bloods series! I didn't get around to writing the review for Masquerade or Revelations because of moving, but since I've already moved and am now just waiting for the boxes to come so I'm writing the reviews now. :) I hear that the graphic novel is being made for Blue Bloods too! Yay! 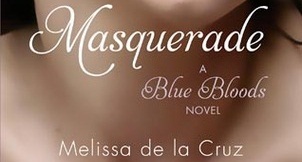 Masquerade was an amazing addition to the Blue Bloods series. It's absolutely wonderful. It keeps you guessing and waiting with some mysteries. Here Schuyler finds out she has new cool abilities that she had no idea she could do, there's a new blue blood, and a lot of trouble (as usual). Melissa de la Cruz. I gotta thank you for creating this group of vampires. Go Blue Bloods! hehe Oh and wonderful love triangle Melissa. Team Jack all the way! :P Seriously love the ball and party! It was wonderfully written. Also, her description of the art in Venice was wonderful. Melissa obviously knows quite a lot about fashion. This series has actually inspired me to work harder on becoming a model. I really admire Melissa now. The ideas Melissa has come up with are amazing for these stories, like everything that has happened and how Lawrence is a rare breed of the Blue Bloods. Lawrence some how seems to me like a wonderful grandfather - though not the best, but wonderful (do I say the word 'wonderful' a lot?) still. Schuyler is so lucky to have a mother like Allegra - not because she is in a coma, but because she is Gabrielle, the Uncorrupted! One of the two archangels who came down from heaven of her own will. Also, her mother still looks out for her even if she's only in a coma. Schuyler is a lot of what I assume Allegra would be like. Strong, brave, understanding, beautiful, talented, and a million other wonderful traits. Mimi makes me so mad. Gosh, I know she's always been bonded with Jack in other cycles, but can't she just allow Schuyler to be with him this one time?! Or allow them to at least hang out?! So not fair! However, she is Azrael, the Angle of Death, so they ought to be careful. Jack. Oh Jack. Why can't you just tell Mimi that you don't love her like that? Why aren't you brave enough to be with Schuyler? You're so in love with her and yet you won't leave Mimi. I understand that she's your bond mate, but really? You can bond with her later. Stay with Schuyler for now! I mean, you're Abbadon! The Angel of Destruction! What have you to fear?! Mimi?! I think not! She loves you too much to hurt you. She'll hurt Schuyler and you know it! Just be a man and stand up to her! Okay. I needa calm down. I'm getting too worked up. So all together I loved this story. It was amazing. Did this meet my high expectations? Of course it did! This should be a movie! And of course I'd like to star as Schuyler hehehe. But I most likely wouldn't and there are plenty of others who could play her (probably far far better than I could, after all they are actresses, but I wanna be one too!). Would I recommend this book and to who? Yes I would. I'd recommend it to everyone who enjoys reading a fun YA novel. Or anything paranormal or romantic or myserious. That's it! Hope you guys read the series! Bye! I read Lost in Time (Blue Blood Series #6) and didn't get the full enjoyment because I had not read the others in the series. Your review is a great reminder to go back and start the series from the beginning. Thank you for your review.